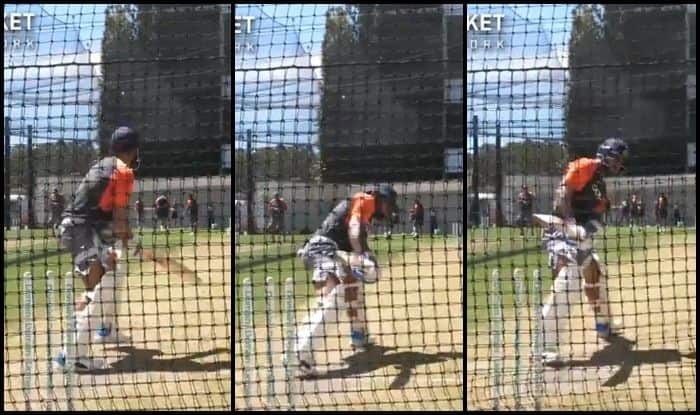 India vs Australia 1st Test Adelaide: The T20Is are over, yet Indian captain Virat Kohli was at his destructive best in the nets ahead of the 1st Test at Adelaide. India vs Australia 1st Test Adelaide: The T20Is are over, yet Indian captain Virat Kohli was at his destructive best in the nets ahead of the 1st Test at Adelaide. It seemed he was getting ready for Royal Challengers Bangalore and was spanking the balls in the MA Chinnaswamy nets. He showed his complete repertoire as he even demonstrated his reverse sweep, a shot he rarely opts for. He hit the short ball with utmost disdain and seemed to be more than ready for the hosts who have a good pace attack. Kohli was ruthless towards the spinners as well as he danced down the track on a number of occasions to Ashwin and Kuldeep in the nets and on most occasions went aerial. India captain Virat Kohli is approaching another landmark where he will join the likes of the great Sachin Tendulkar, VVS Laman, and Rahul Dravid. Kohli is eight runs away from becoming the fourth Indian batsman to score 1000 runs in Test cricket in Australia. Kohli is on 992 runs and has five centuries Down Under.